When you're shopping online you usually have the option to apply filters such as shoe size, colour or dress style. Users have the control of narrowing down what they would like to see from the list. Filters can be applied in Dynamics Portals which is what I go through in this quick tip vlog. 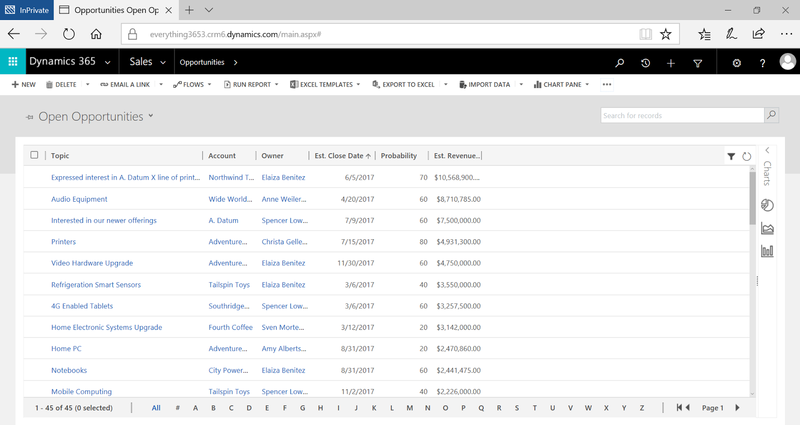 A view in Dynamics Portals is displayed through the combination of an Entity List and Web Page. In an Entity List there's a section called Metadata Filter. In here is where you can configure the filters for the list. Note: You can apply more than one filter. In my vlog I added another filter that allows users to filter by Program. 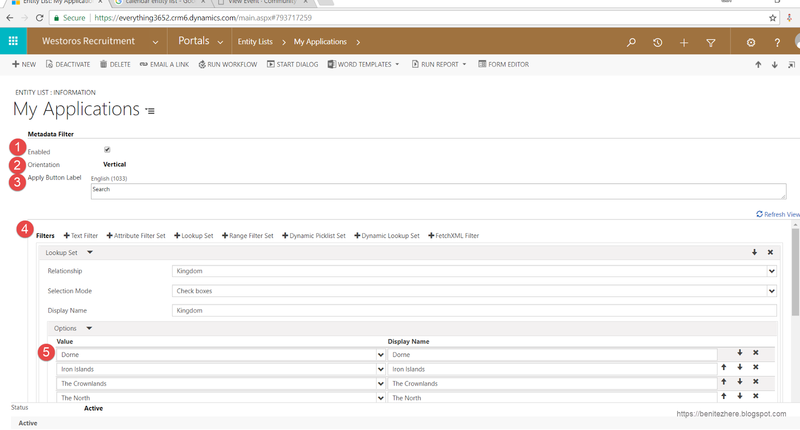 Filters for Dynamics Portals is a simple configuration exercise, no code is needed to provide this type of functionality. Shout out to some of my new Twitter followers from last week :) Follow me on Twitter. 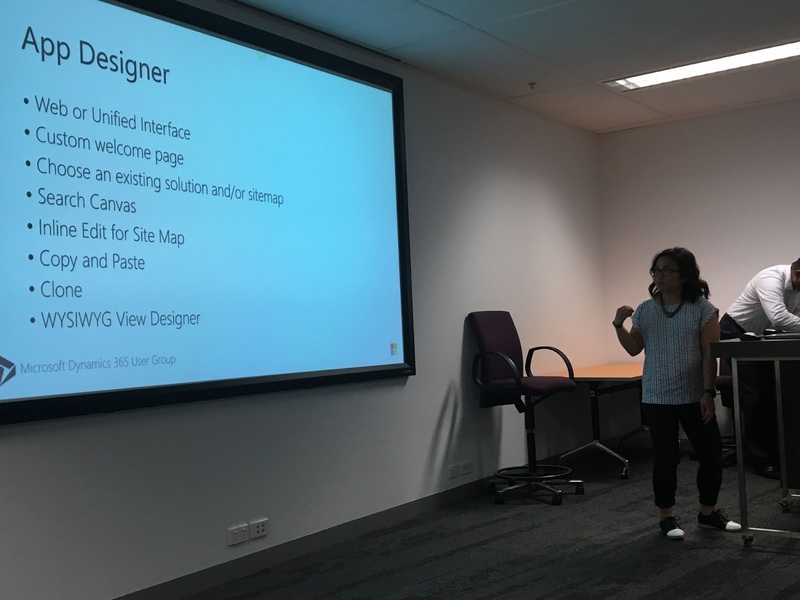 I presented the App Designer V9 features in the last Melbourne Dynamics User Group for the year alongside Scott, Andre, Nadeeja and Shane. 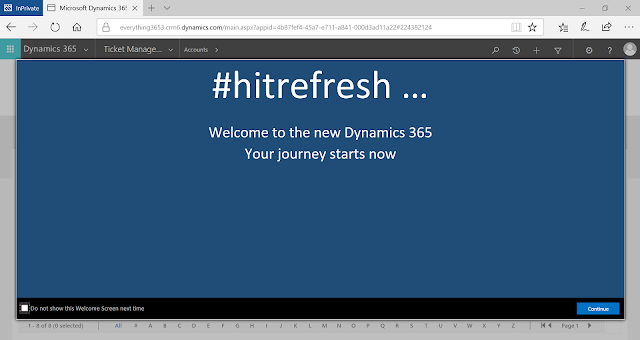 We all teamed up in presenting the latest and greatest of Dynamics 365 V9. It was the largest attendance we had in 2017 which was awesome! I'm a huge fan of the App Designer and I've previously vlogged and blogged about it here. This time round I'm showing you some of the old and new features from the V9 Customer Engagement release. The following is what I covered and you can check this out in my vlog below. You can select what type of App you would like to create. Web is the traditional interface you are used to where as Unified Interface is the new look and feel when browsing through a device such as mobile or tablet. 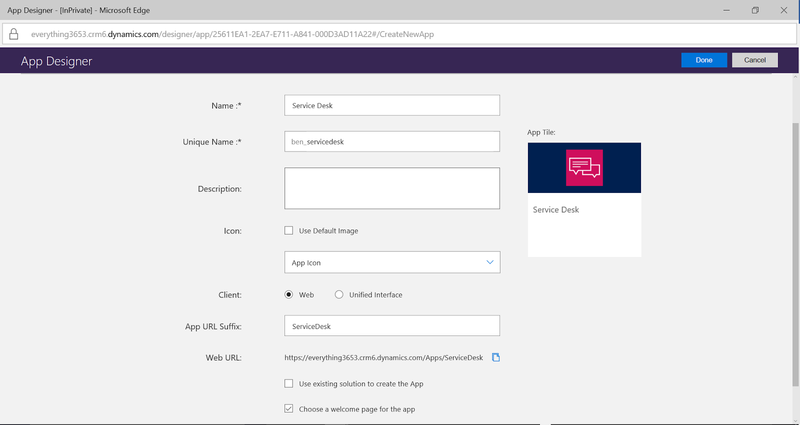 This is useful because you can now build dedicated apps for your devices. One current example is I'm working with a client where their employees out and about only need quick and limited information about their customers on their phones, so we built an Unified Interfaced app with reduced information for this purpose. This one I did cover previously. 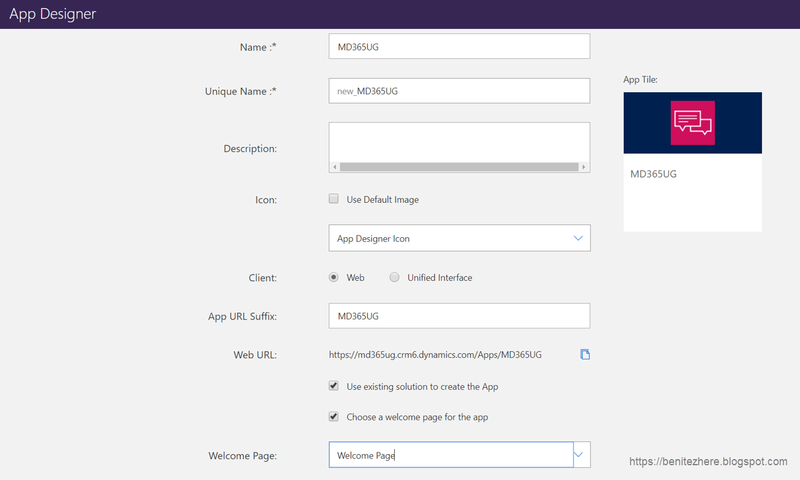 You can configure an App to load a Welcome Page that will appear when an end user opens the App. No more of this lady. 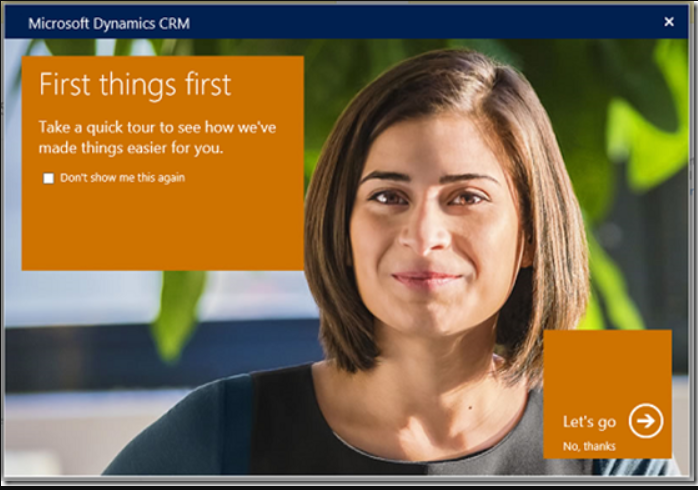 This is great for Dynamics 365 Customers that want to make the experience more personal or display some quick tips outlined to the end user. The first thing you need to do is create a simple web page. Then you need to upload this file as a Web Resource in a solution. When creating a new App, you'll be able to select the web resource. After you're done building your App, you can then test it out. You can build an App outside a solution by navigating to Settings > My Apps > Create New App. In this scenario, you can select the Solution or Sitemap you want to associate the App too. This will still load even though if you create the App in a solution. The Search Canvas allows you to search for components within your App Designer which is handy when you have many entities in the App. It allows you to have quick and easy access to the entity. The Inline Edit allows you to change the label of a component in the Site Map easily without having to use the wizard on the right hand side. These two are similar in nature from the looks of it. I haven't discovered yet how they differ from each other. They pretty much create the same component you have selected. This is my personal favourite! I go through this in detail in my vlog so go check it out if you haven't already. Traditionally you build views through a solution and you add the fields you want to display as columns, adjust the width of the columns and configure sorting. The nitty gritty aspect of this process is having to publish the view, navigating the view and check that it looks alright in terms of position of columns, whether the column width needs to increased etc. It's trial and error. The WYSIWYG View Designer allows you to review your view in real-time. You can instantly see your information in the view and adjust accordingly. Pretty neat. You can also continue to use AND/OR statements and apply filters. What I did find is that you can't edit views in the WYSIWYG View Designer once you have saved and exited from the view you created. You would need to edit it within the solution. Who knows, it could be made available in a future release. Have a play with the App Designer if you haven't done so already. It's really cool and it's changed the user experience as you can now personalize it based on their role and their daily interactions with Dynamics 365. You can create a custom Welcome Page and the new Site Map Designer features of copying and pasting will be handy when replicating the same entities in another Area. 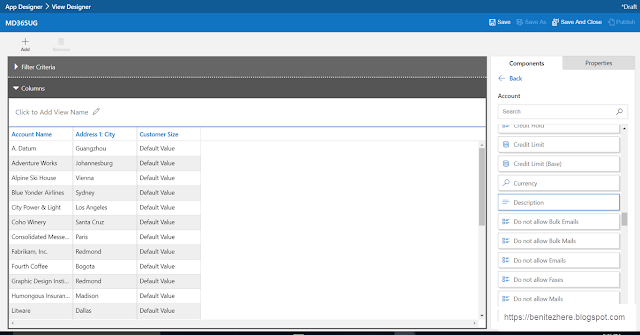 I do like the new WYSIWYG View Designer and I think it's a teaser of what else is coming in terms of making it easier to configure and customize in Dynamics 365. Whenever I do testing for Dynamics projects, I tend to do it in the context of the user of the user story. When testing as the user role, you're ensuring that the acceptance criteria of the user story has been met. Usually with Dynamics Portals there will be Web Roles that are created and assigned to portal users as there can be more than one user role interacting with the portal. 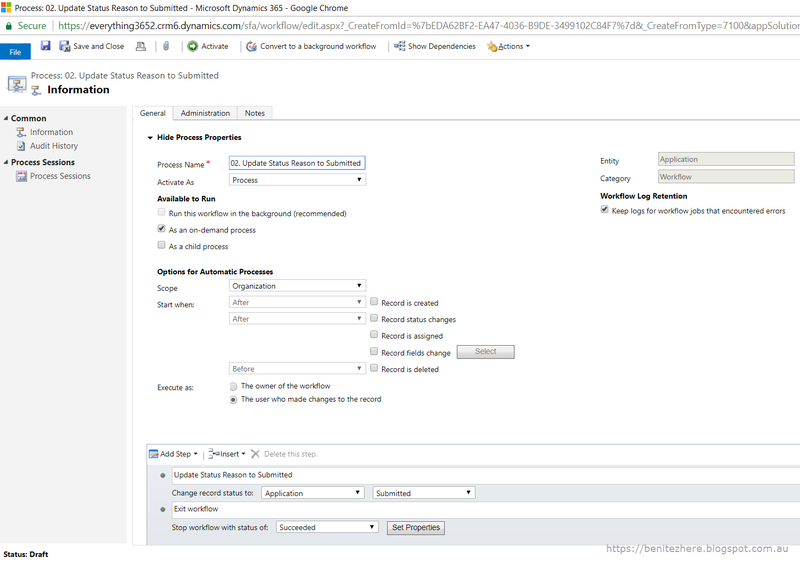 The behaviour that follows when testing in Dynamics Portals is to often delete test records or tweak a user experience by changing a configuration and repeat the testing steps. With Dynamics Portals, you browse to a particular page that allows you to clear the cache so that the latest changes can be in-sync with Dynamics 365. However sometimes you see a blank page. This use to confuse me when I did my testing when I first transitioned from Adxstudio Portals to Dynamics Portals. Wondering why? This is what I explain in my quick tip vlog. Check it out. As seen in my vlog, if you browse to https://yourportal.microsoftcrmportals.com/_services/about you may encounter seeing a blank page. This is because you're logged in as a portal user that does not have the administrator web role due to testing in the context of the user of the user story. 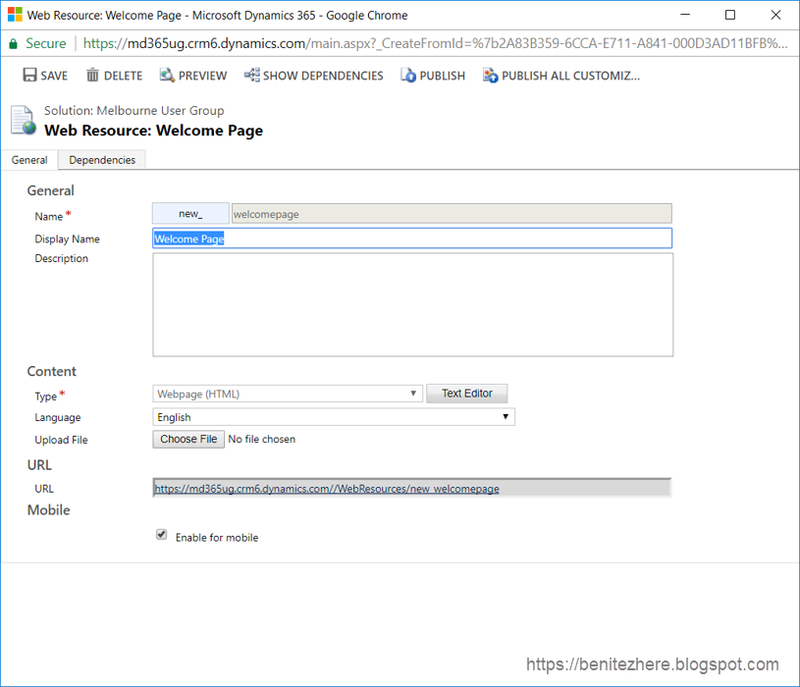 Simply either log in as a user with the Dynamics Portals administrator web role or temporarily assign the administrator web role to the user you are testing as and immediately remove it afterwards. Thanks for checking out my quick tip. Till next time, toodles. In each Web Form, Web Form Steps were applied to guide the user in the application process. I showed that by relabeling the buttons and using a redirect Web Form Step to provide the sense of an application being saved, followed by a workflow to allow the application to be submitted. Have a read and watch my vlog if you haven't already done so. 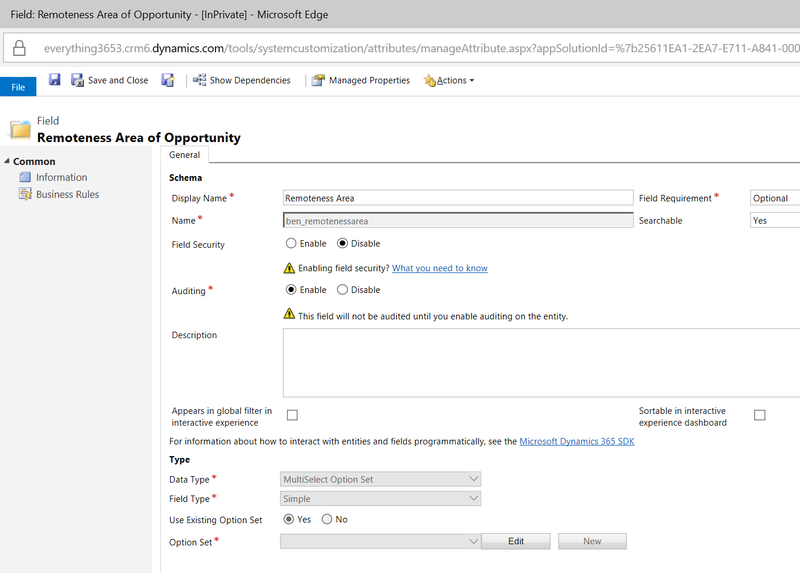 This time round I'm showing you how to achieve having an edit and read-only mode of an application in Dynamics Portals. Can't I do this already? It's not immediately apparent. Allow me to explain. In a Dynamics Portals Entity List, there are two fields that reference Web Pages. The first is Web Page for Details View, the other is Web Page for Create. These two fields will reference a Web Form where you can configure the desired output. 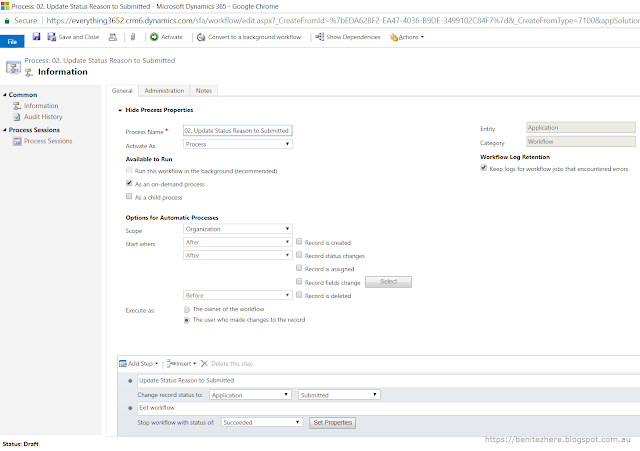 For example you can set the Web Page for Create to point to a Web Page that will load an entity form to allow the portal user to create a record. 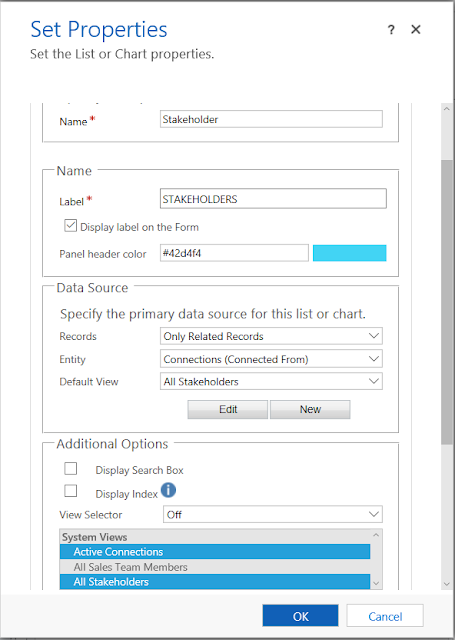 The Web Page for Details View is what will load when the record is opened from the Entity List. This means the Web Page will point to a Web Page that will load an entity form to allow the user to edit the record. What I'm about to explain next is a follow-on user path from my previous vlog. The user scenario is that sometimes a business requires their customers to be able to go back and edit the application which I demonstrated previously. However after the user submits the application, the application should be in read-only mode as it needs to be reviewed by the business. 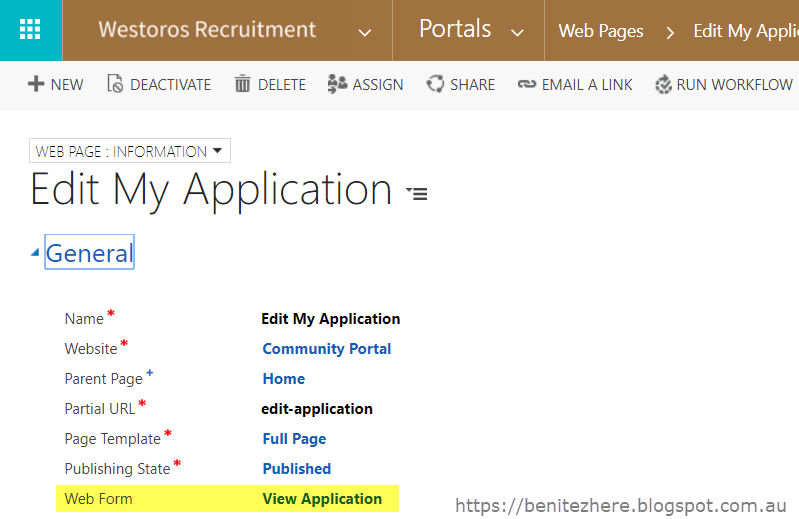 If a user goes back to a submitted application and opens it, what happens? Since a Dynamics Portals entity list can only reference a single Web Page as defined in the Web Page for View Details field in the Entity List, the end user experience will be that they can edit the application as the Web Form Steps previously configured will come into play. My first step was to load the fields that allow a user to select the Kingdom they want to apply for. It wouldn't load the form in read-only mode because it hasn't been told to do so. 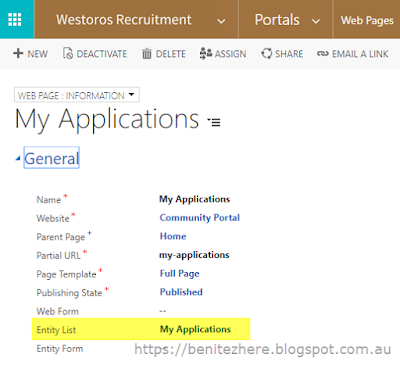 The user can edit the application even though they shouldn't due to the Application Web Form referenced in the Web Page as defined in the Web Page for View Details field in the Entity List. 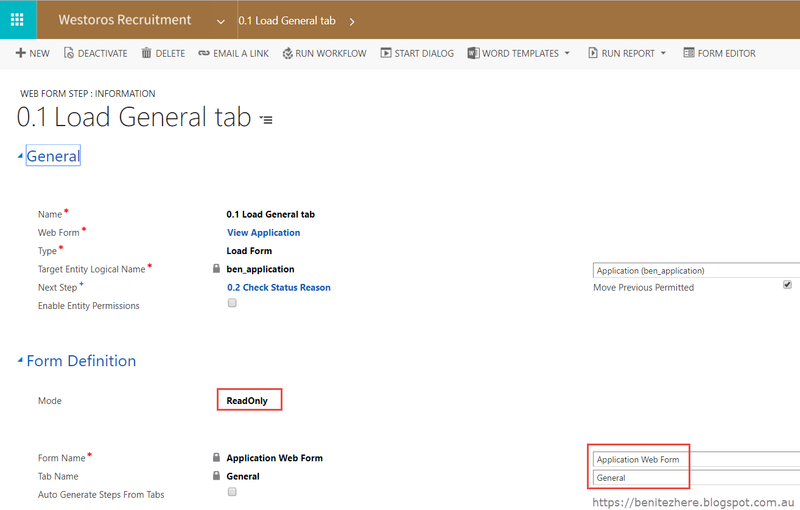 What you can do to achieve edit vs read-only mode is to use a conditional Web Form Step in the Web Form that is associated to the Entity List as defined by the Web Page for View Details field. Check-out my vlog for a step-by-step guide. The key here is to use a mixture of conditional Web Form Step with a read-only Web Form. Update the existing Dynamics 365 entity form to have a dedicated Tab for the common fields. 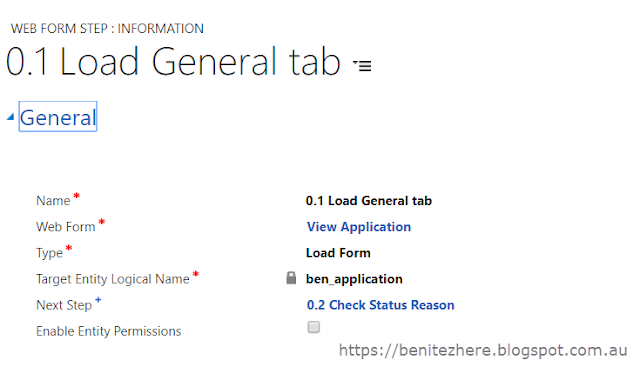 In my vlog I use Application ID, Created On and Status Reason and called the Tab General. In the View Applications Web Form, you'll need to create three new Web Form Steps. Update the View Applications Web Form first step to be the Loading of the General tab and the next step to be the Condition Web Form Step. This Web Form Step will be the first step that will load common information for an unsubmitted and a submitted application and is only referencing the General tab. This Web Form Step will be a conditional check. A Condition Web Form Step allows Dynamics Portals to check the value of a field before presenting the next logical Web Form Step. What we are creating here is a fork basically, I want the user to view their Application in read-only if the status reason of their application does not equal "Unsubmitted." Otherwise if the the user's Application does equal Unsubmitted then I want the user to proceed with the first Web Form Step in editing their Application. 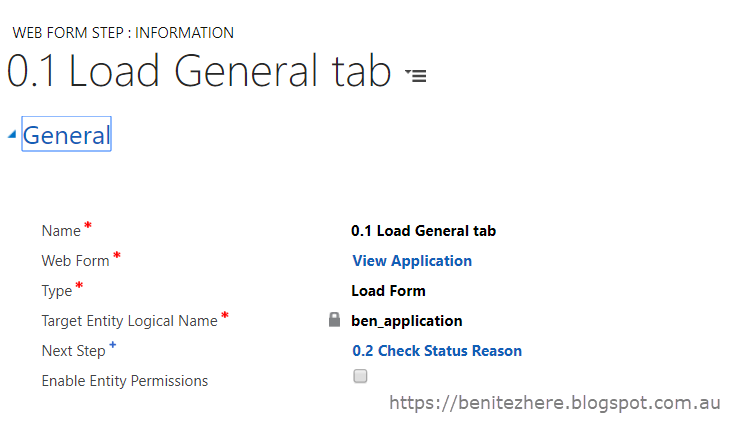 The next step from the Load General Tab Web Form Step is the Conditional Web Form Step. This will then either load the Edit Web Form Steps or the Read-Only Application Web Form Step. When Naming Web Form Steps, use sequential numbering as this will help you and anyone else who is will be administering the Dynamics Portals long term. You understand immediately the ordering of the Web Form Steps. Steps 0.X represents the pre-load of the Application. Steps 1.X represents the Edit steps of the Application should the condition of Application does equal "Unsubmitted" is met. Steps 2.X represents the Read-Only outcome should the condition of the Application does not equal "Submitted." Once completed, clear the portal cache and create a brand new application to test it out. 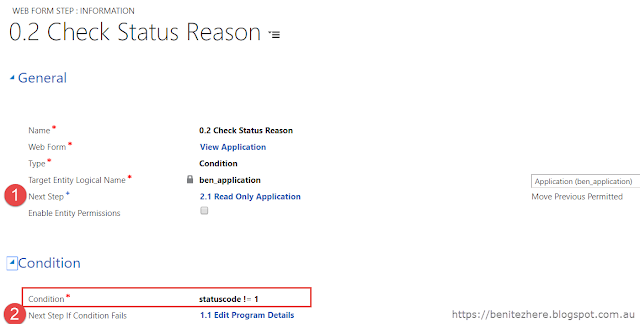 Load the application and the condition web form step will check in where it will recognize the status reason is unsubmitted. The next steps that will follow shortly after is the Edit web form steps. Go through the Edit steps and then Save and Close the application. 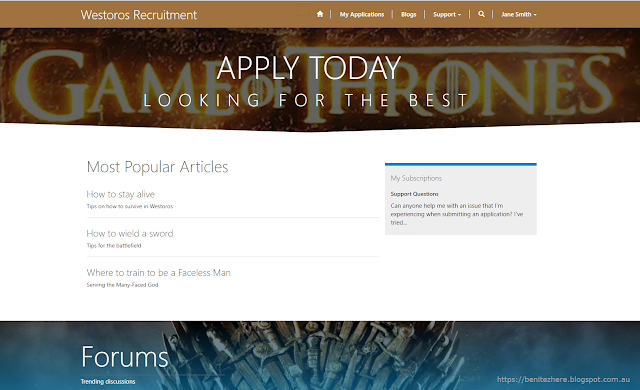 Now submit the application and when you navigate to the submitted application, it will now load the application in Read-Only mode. I combined different configuration methods to achieve an Edit vs Read-Only Application for a single Web Form that is associated to the Web Page of the "Web Page for Details View" field in the Entity List. By default, this field can only load one Web Page where the Web Page references a single Web Form. By configuring the Web Form to have a conditional Web Form Step to have two outcomes allows the Edit vs Read-Only concept. 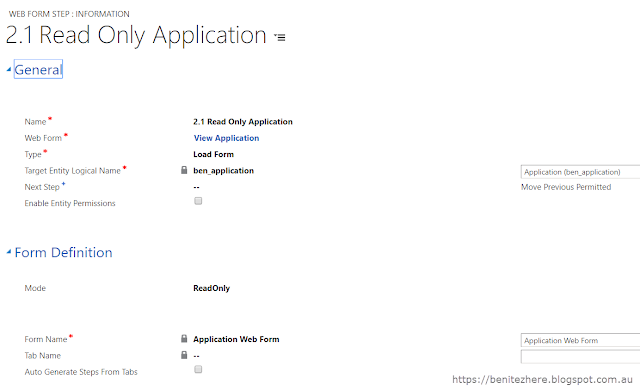 Based on the Application Status Reason, the next process will either be the Edit Web Form Steps as demonstrated in my previous vlog or the Read-Only Web Form Step. Thanks for reading and watching my vlog. Big thanks to those who have left comments on my YouTube channel in the last year, always makes me smile when someone posts nice feedback. I do this with the hope of helping some other soul out there. Don't forget to follow me on Twitter, I have a low count of Followers as a newbie. Thanks again for those who have started to follow me. Dynamics Portals was launched in May 2016 where the foundations derive from Adxstudio Portals. One of the features available is Web Forms where Web Form Steps can be configured to replicate a step-by-step form experience for portal end users. 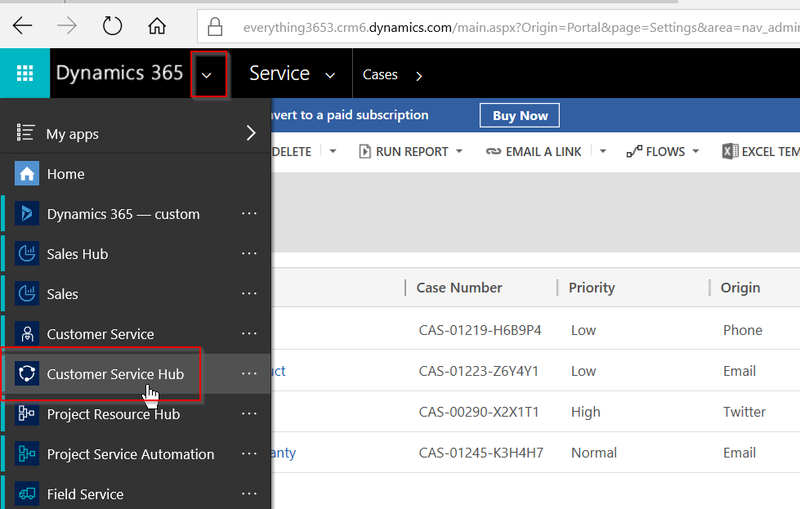 As always when learning for the first time, you pick up on the basic functionality such as configuring a Dynamics Portal Entity Form to point to a Dynamics 365 entity form. For example, the "Customer Service - Create Case" Dynamics Portals form that end users see when creating a new Case is the "Web - Create Case" Dynamics 365 entity form. Once you get past the basics there's the second part of learning - unlocking what you don't know by exploring and working with what's available to create a cool output. This is what I cover in Part 1 of my Web Form vlog series by showing other configuration within Web Form Steps that can be utilized to change the end user experience. Watch my vlog below to learn more. Application - details of the position they are applying for. Compliance - proof of evidence that needs to be supplied such as Passport. This is inserted as a sub-grid in the Web Form Step. How this ties in altogether is illustrated in the ERD diagram below. ERD probably isn't the best method for outlining how it all works but I find it helps whenever I teach people about Dynamics Portals. 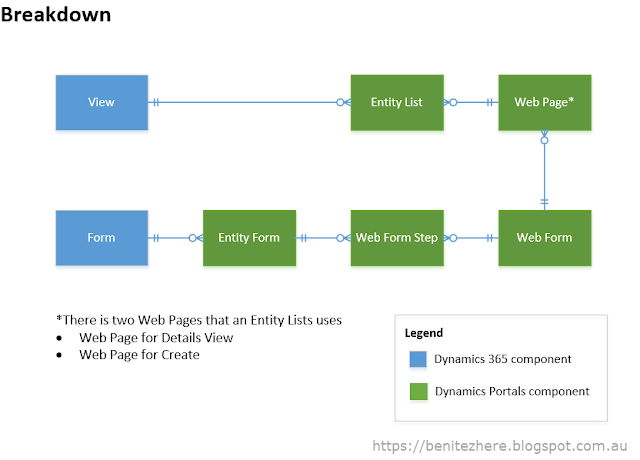 The above is how you would configure Dynamics Portals Web Forms and Web Form Steps. These are the components required to set up a flow of information an end use needs to complete. The end user experience for the Application process is as follows which is represented by the Web Forms Steps. What you don't realize until you configure Web Form Steps and do a run through is that the Previous, Next and Submit button isn't quite what you think it is. When your first Web Form Step is an Insert in a "New Application" process, the record will be created in Dynamics 365 when the end user clicks on the Next button. Any other clicks within the Web Form of Previous, Next or Submit (in the last Web Form Step) will save any changes made along the way. They are all a "Save" button in the context of Dynamics 365. If you have used other portals before, there is functionality where end users can go back to a saved form to complete at a later date and submit when ready. 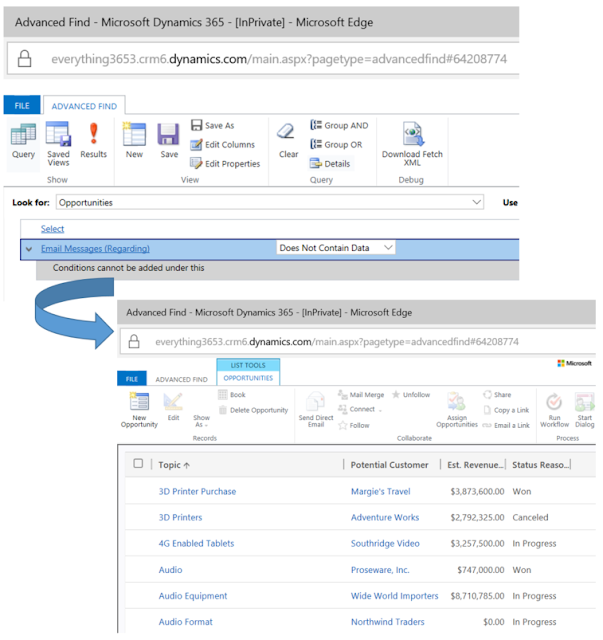 Due to the nature of Dynamics Portals with Dynamics 365, this is not the immediate experience as by default in Dynamics 365 when a record is Saved, it is created or updated. Dynamics Portals respects this. With additional configuration methods, you can achieve a similar outcome to the Save and Submit experience. As you would have seen in my vlog (please watch if you haven't already done so!) when a end user clicks on "Submit" in the last step, a message is displayed and the end user remains in the last Web Form Step. If they wanted to go back to the My Applications view (this is an Entity List), they need to click within the top navigation menu. This is an extra click and in my opinion not the best user experience. They should automatically be redirected back to the My Applications view. To achieve this, you can create a new Web Form Step where the type is "Redirect." This way when they click on the relabeled Save and Close button in the last Web Form Step, the Redirect will be executed taking them back to the My Applications view. Hold on to your horses, there's actually something else you need to configure before hand. 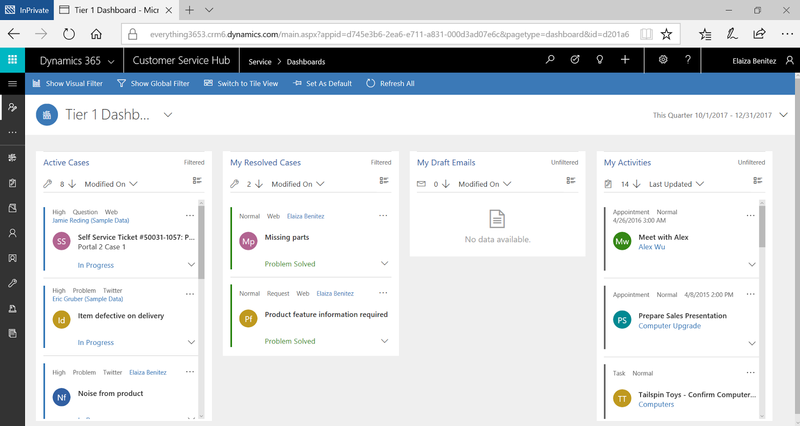 One thing to know about Dynamics Portals is that there's quite a number of configurations to complete to get one process to work as it's all native within Dynamics 365. So for a Web Form Step to redirect to an Entity List, you need to first create a Web Page that references the Entity List. In the screenshot below, you'll see that my Web Page is linked to the My Applications Entity List. 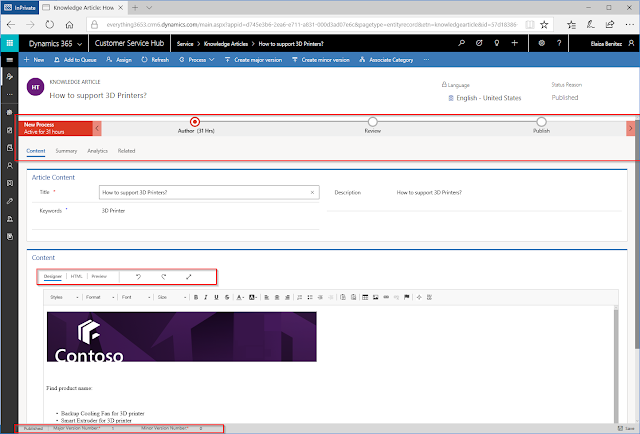 Once you have a Web Page that points to the desired area in Dynamics Portal, select the Web Page in the redirect Web Form Step. The last bit of the jigsaw puzzle is to utilize a workflow that will update the Status Reason to allow the end user to "Submit." I created a new Status Reason of Submitted and updated the default value to Unsubmitted. I then created an on-demand workflow that will update the Status Reason from Unsubmitted to Submitted. 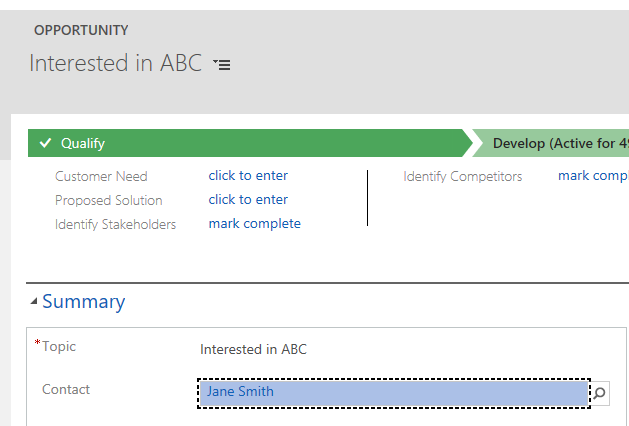 After the workflow is created, you then need to create an action within the Entity List. Why? Well the last Web Form Step is redirecting back to the Entity List. 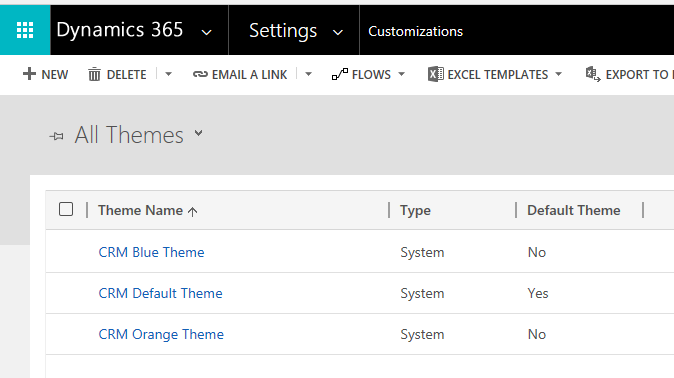 Entity Lists can have additional actions where one of them is calling a workflow. In this case, we want to link the workflow so that the Application Status Reason can be updated to Submitted. Simply associate the on-demand workflow to the Entity List and update the label to something more meaningful such as "Submit Application." 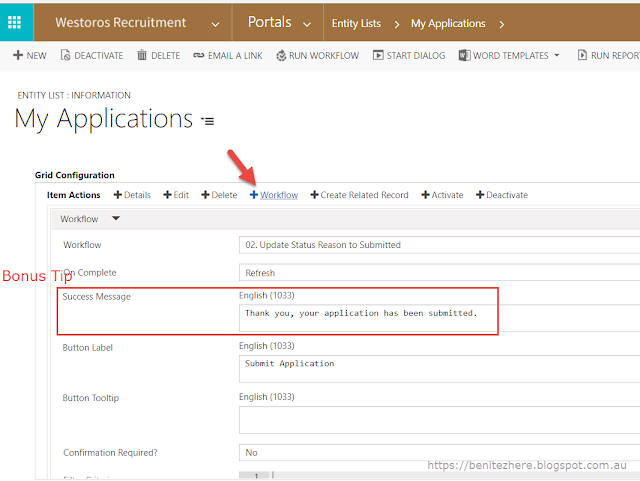 Update the message of the workflow to something more meaningful such as "Thank you, your application has been submitted." By default, the success message is "Workflow was initiated" which doesn't really make sense to the end user. Hold on to your horses (again), there's something else I recommend you configure before hand. Make sure you have two filtered views that the Entity List will display. Unsubmitted applications where Status Reason is Unsubmitted. Submitted applications where aStatus Reason is Submitted. This will allow the end user to switch between the views. 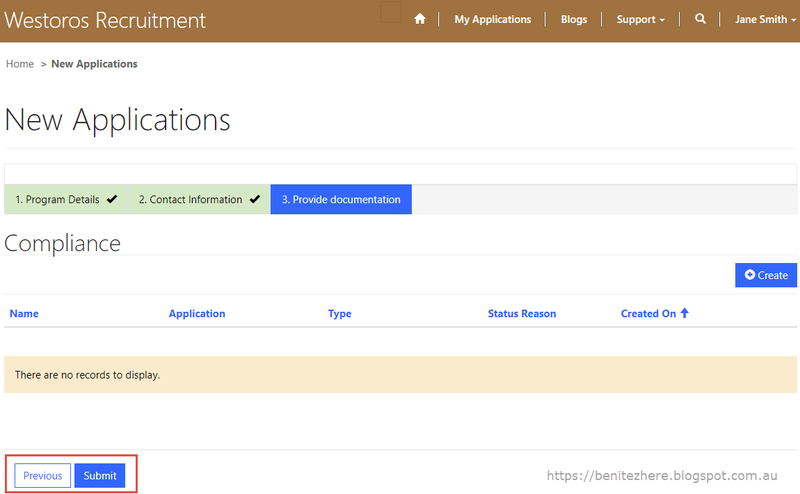 Once the configuration has been completed, the end user will now be redirected back to the My Applications view in the last Web Form Step. 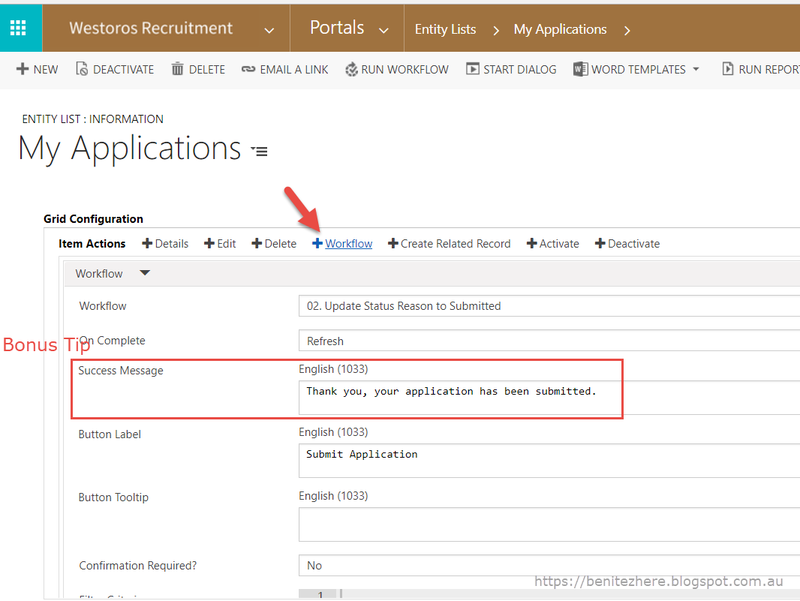 The end user can then submit their application when they are ready by clicking on the Submit Application "button." 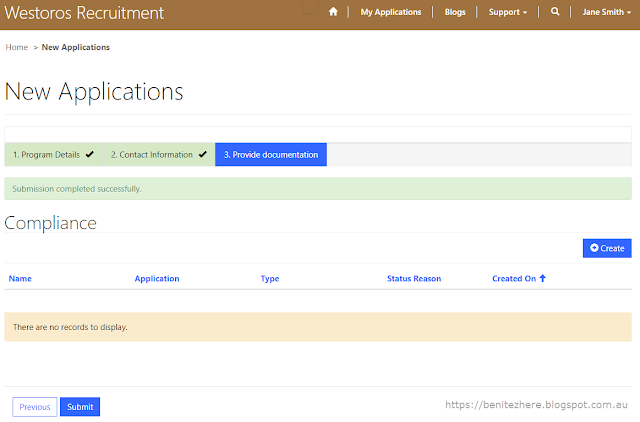 Once the workflow is successfully completed the application will drop off from the Unsubmitted Applications view and appear in the Submitted Applications view. Ta-da! 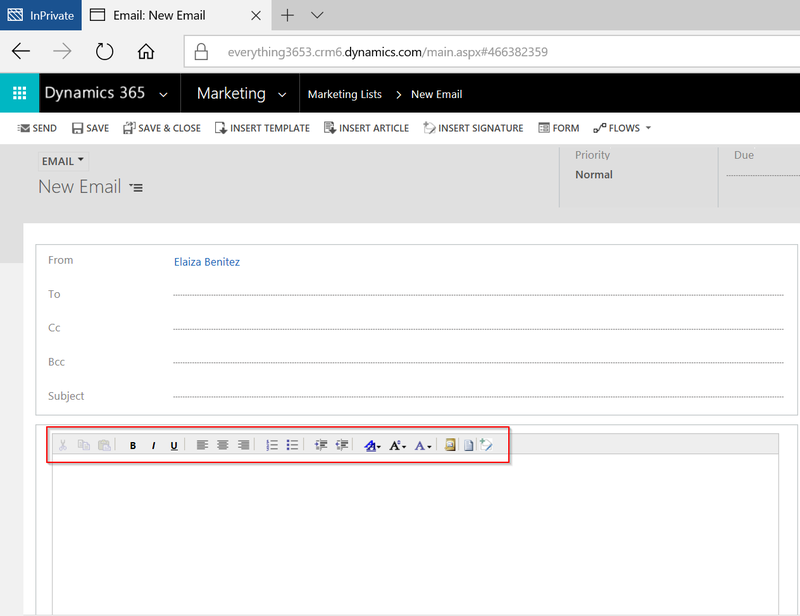 Dynamics Portals is native to Dynamics 365 and respects how it works out-of-the-box which is why the buttons will create and/or save a record when using Web Forms (or Entity Forms). In this vlog post, I showed you how you can use other configuration methods to achieve the save and close, and submit functionality. Be open minded and explore what else can be done to achieve a similar outcome. Make sure you subscribe to my YouTube channel and follow me on Twitter. I'm new to Twitter and so far it's going OK! Thank you to those who have followed me so far on Twitter. 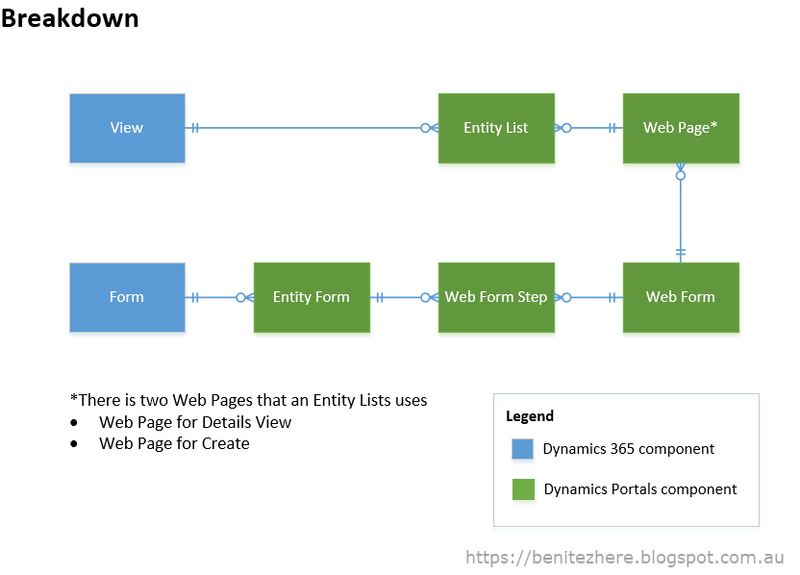 Stay tuned for Part 2 of Dynamics Portal Web Forms with me. 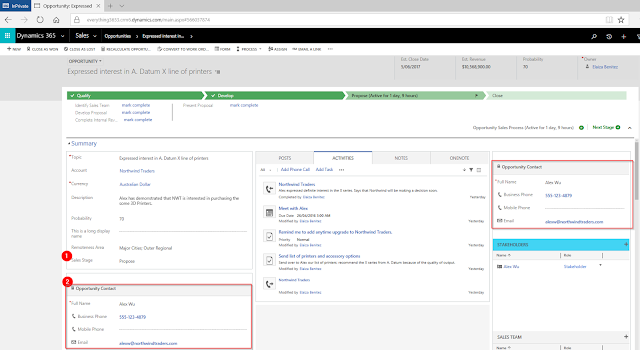 In the first week of October 2017, version 9 of Dynamics 365 became available and is now the version applied when provisioning a new Dynamics 365 trial instance. I've reviewed most of the updates outlined in Microsoft's list of features which is outlined in this post. As usual, I've outlined my observations and findings so far in the end of this post. The entire look and feel of entity forms has since been updated for end-users. You will also notice that the form header is different. The fields that are in the header form will not appear as being "cut-off." A lot of Customers found this annoying but now is resolved, hooray! The system views and dashboard user interface appear differently as well. The same heading scheme and borders is consistent to the entity forms. You no longer need to play with the field label length when the Display Name is long due to a high number of characters. 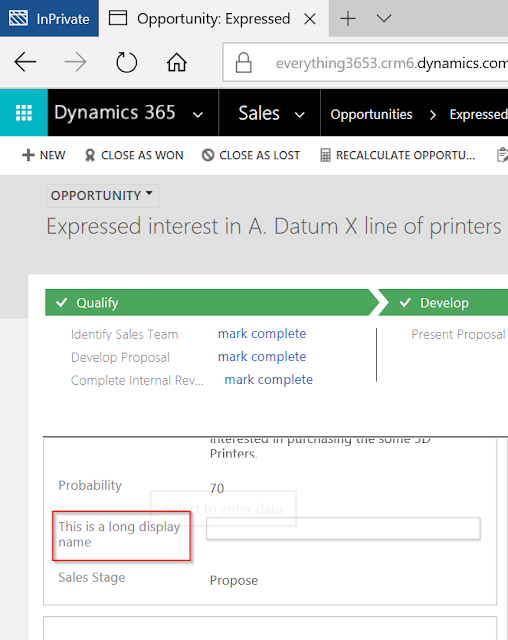 Dynamics 365 will automatically adjust by wrapping the field Display Name. Previously you'd see this window when trying to load the Interactive Service Hub and it would take a while. In version 9, there's been more improvements to the Unified Interface Framework. As a result, the Interactive Service Hub has changed and is now called Customer Service Hub. It loads instantly too. If you also click on the Hamburger icon on the left hand side, a vertical menu appears which is pretty cool. The Knowledge Articles have also had a user interface refresh. Accessibility within Dynamics 365 is now available. This is great for Australian government agencies that are required to be WCAG compliant. This is something that has been asked for in the past from government agency clients I've worked with and can now be reviewed and tested by accessibility readers out there. I don't have a reader myself to test this. 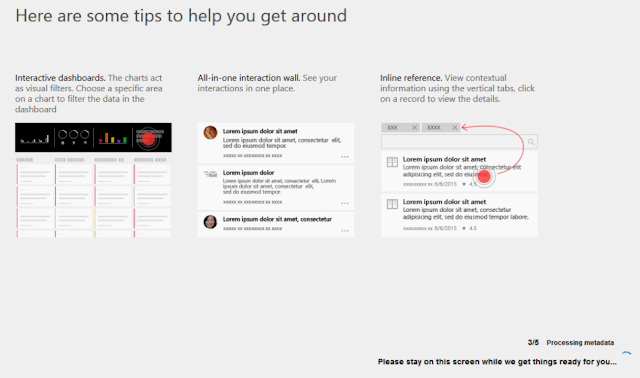 Below is a summary from the Microsoft's list of features. People with screen readers can skip to content directly and navigate to sections that are important to them. People using reading plugins receive great results. People using browser plugins can jump to specific sections on a page. Keyboard users can save time and effort by using the tab key and keyboard shortcuts. In the screenshot below I’ve hit tab from the Topic field. You can now change the sub-grid colour on entity forms. A CRM super user can update the hex colour of a sub-grid in the form customizations. 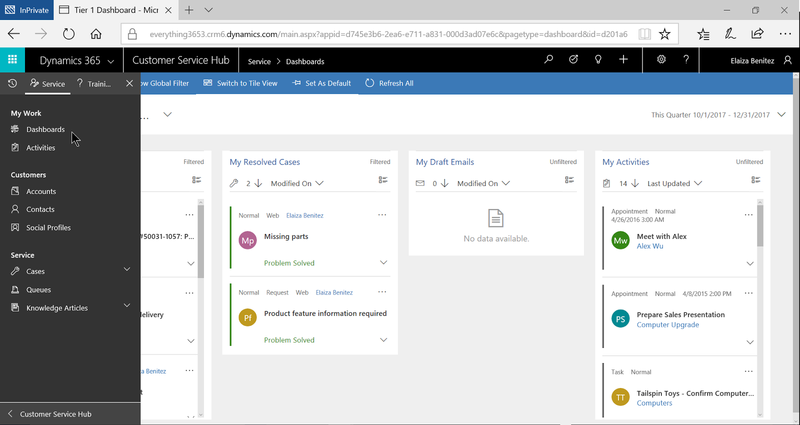 Customers of Dynamics 365 will need to plan their colour palette according to their company branding or adopt a new colour scheme for the different components such as Blue for Connections across all entity forms that displays a Connection sub-grid and Orange for Contacts across all entity forms that displays a Contact sub-grid. This allows easy identification of record types when viewing sub-grids. This a feature that a few people have asked for over the years. It's now available, hooray! There's a new attribute type of MultiSelect Option Set. In my screenshot below, I've created a Remoteness Area field. Remoteness Area is common in Australian government agencies. Three new themes are available. I've made the assumption here that existing Dynamics 365 Customers will already have their Dynamics 365 theme for Production in alignment to their company branding. In my opinion this is useful for Sandbox environments to have a different theme to Production for users to easily identify non-Production environments. I covered the App Designer in a previous post. It's one of the neat features of Dynamics 365 and I'm a fan of it. 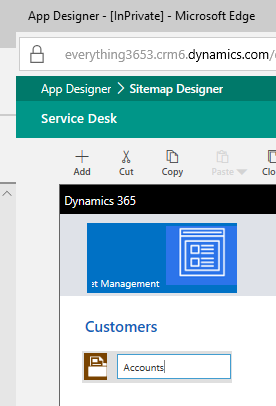 You can inline edit the Title of a component in the Site Map designer. You can configure an App to load a Welcome Page that will appear when an end user opens the App. 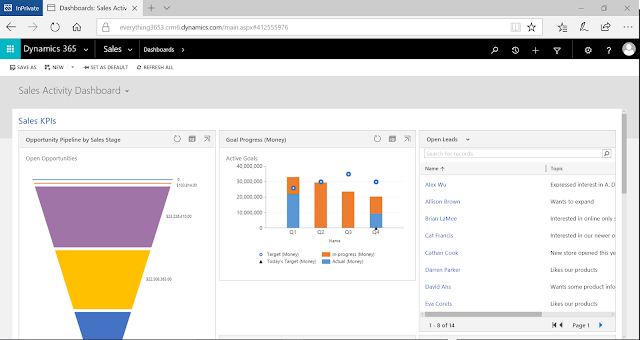 This is great for Dynamics 365 Customers that want to make the experience more personal or display some quick tips outlined to the end user. You need to upload a .html file as a Web Resource into Dynamics 365. I created a simple web page using Microsoft Word and uploaded it as a Web Resource in a solution. You can now build a query that allows users to search for data that does not exist, such as Opportunities that do not have an email activity. You can now use the WYSIWYG Editor in Email Activity. Below is a list of things I've found while reviewing the new updates to Dynamics 365 in version 9. It wasn't displayed under the usual area within Settings > Application. Or you can get to it through the Apps menu. I was excited about this but then after doing a thorough review, I'll be more excited for a future release. Entity System Views - when using Edit Filter Criteria. Workflows - when creating a conditional step. Marketing Lists - since System Views can't be configured. However workaround is to create a Personal View and then this can be used in the Marketing List. I tested this and it works. It's limited to Advanced Find only for now. I'm hoping the Dynamics 365 Products team will expand on this feature across the functionality outlined above. If you still want to create NOT IN Entity System Views, you still need to use XrmToolBox for it. However a reminder that when using XrmToolBox FetchXMLBuilder for NOT IN views, you can only configure it through the XrmToolBox. You won't be able to edit the view through Customizations. It still leverages what we saw back in version 4. 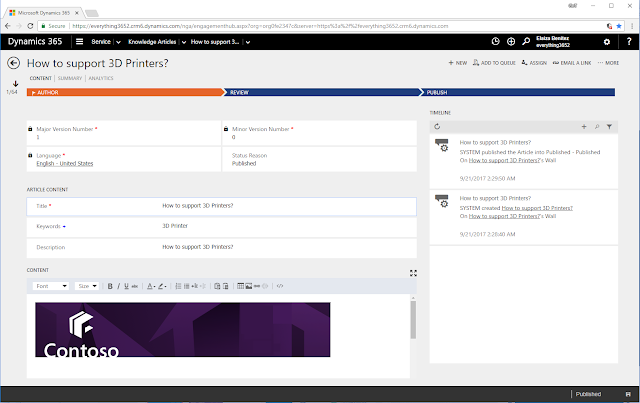 I'm hoping the Dynamics 365 Products team will expand on this feature by bringing across the WYSIWYG Editor from the Customer Service Hub Knowledge Article. I found a couple of odd behaviours with this. If I went back to the App to change the Welcome Page to point to a different web resource as my Web Page, it would not save. I tried both in Google and in Internet Explorer Edge. I had to create a brand new App which was inconvenient. So be careful here! Make sure you are 100% certain that the Web Page is finalized before building your App. If I inserted an image in the Word file, it would not load. I tried both Web Page and Web Page, Filtered as the file type but still didn't work. Therefore I opted to insert text instead of a .png image. I'll be logging a new item in Microsoft Connect when I find the time to do so. I came across another odd behaviour with the Opporutunity entity. Usually as you progress in the stage of a Business Process Flow, the Process Stage record will update as the entity has a N:1 relationship to Process Stage which captures the Business Process Flow Stage information of an Opportunity. In version 9, this information is not being automatically populated. I tested this in another version 8 instance trial that I have access to still and it works as expected. I found this when I was testing a workflow I built that was updating a custom field with the Stage Category Name. I was scratching my head trying to figure out why it wasn't working and then discovered the Process Stage fields is NULL. When I then tried progressing to the next stage in a customized Business Process Flow, an error was being thrown which was referencing an out-of-the-box plugin. I think it's caused by the NULL Process Stage fields. I noticed a couple of things with the reboot of the Opportunity Main Form. 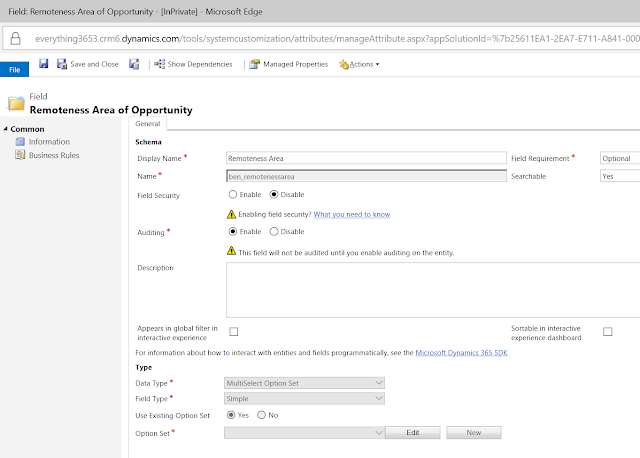 The Opportunity Sales Stage field displayed is a global option set that can't be customized. Refer to my other blog post that somewhat touched base on this field. 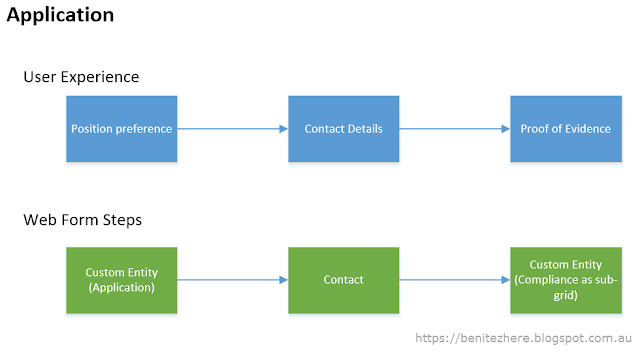 Since it can't be customized to reflect configured Business Process Flow stages, it's best to remove it on the form otherwise it will confuse end users. The Contact Quick View form is duplicated. I recommend removing one of the duplicated Quick View forms. Overall the above is my review on the new features of Dynamics 365. 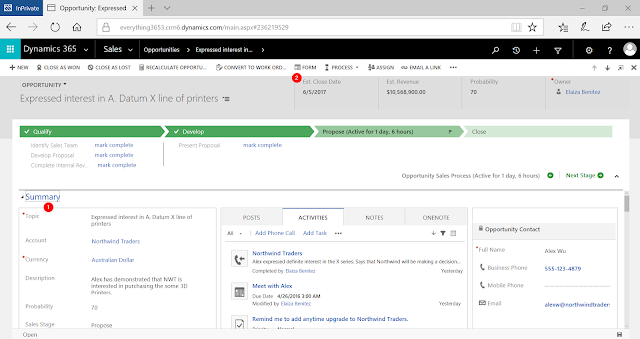 It's improved a lot and it's really cool to see what the Dynamics 365 Products team have accomplished to date. If you are reviewing Microsoft's list of features, I couldn't figure out some of them such as the Timeline or Business process flow as Action steps. Either I was looking in the wrong place or they're not available just yet. I'm new to it so any tips, do share with me!